I read Boys Adrift about seven years ago – I can’t remember how I heard about it or why I picked it up, since I didn’t have any children, but I’ve remembered the major points of it all these years and was really impressed by Sax’s straight-forward and interesting writing style, plus his practical suggestions for parents. 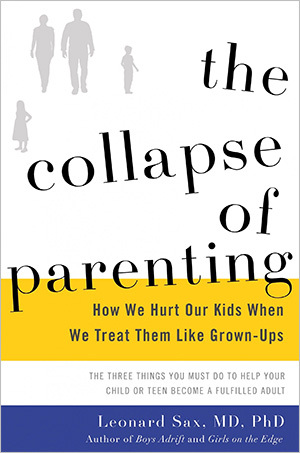 So when I saw The Collapse of Parenting, which came out last year, I knew I wanted to read it immediately. And it was one of those books that once I started it, every other book in my currently-reading pile got completely ignored until I’d finished this one. Also, Bart was out of town, so every night when he’d call, I spend thirty minutes of our phone call reading him sections of the book and telling him stories from it. I’m sure that’s EXACTLY why he called home. The basic premise of the book is that the current culture is one of disrespect (not only toward parents, but toward teachers, peers, and basically the entire world) and that parents have very little authority in their own homes over their children. And yet, this doesn’t make their children behave better or love them more – it means their children care way more about what their peers think about them than what their parents think. And Sax thinks the idea of children being led by other children is a scary thought indeed (as do I). That lack of parental authority leads to major breakdown as children grow up without the skills to deal with the challenges of teen and adult life. He then has four chapters about ways you see this lack of authority playing out in negative ways in today’s society. First, there’s health. Because most kids would choose junk food over healthy food and watching TV and playing video games over active play, and without a parent there to say “You’ll eat what we serve” and “the TV is off for the rest of the afternoon,” kids are more likely to be overweight and out of shape. He’s certainly not saying this is the only cause of childhood obesity, but it is a contributor. Second is how many American children are now on prescription medications (if you’ve read any of Sax’s books, you know he’s pretty cautious about medicating children. Some children get major benefits, but the skyrocketing numbers of childhood prescriptions are cause for concern). Third, is how far Americans are falling behind academically – no surprise here. He quotes The Smartest Kids in the World, which I thought was a really thoughtful look at American education versus the education systems in other countries. There’s also theories that say that disrespectful American students is the price we pay for higher creativity, but the stats point to decreased American creativity, with the number of new businesses formed in the U.S. dropping by half in the last 35 years, across all states and economic sectors (again, new businesses aren’t the only indicator of creativity, but those numbers are not reassuring). And fourth, and most interesting to me, was how fragile children are now, meaning they really struggle to deal with setbacks and disappointment in sports, school, friendship, and work, which is a bad thing as they grow into adults. Anxiety and depression are on the rise, and in a decade, America has dropped from the country with the most employed or job-seeking young people to 8th (this might seem like a problem with the economy, but no other countries saw changes like this except Australia which jumped from #7 to #3 – it just appears that fewer American young adults are concerned with having a job or looking for one). I’ll admit that there were parts in this first section where I was a little skeptical about the causation in some of his claims. I think there are generally good principles, but I’m not sure it’s as cut and dry as he makes some of it seem. The second half of the book is dedicated to solutions, and this is where I think Sax really shines and where I felt more solidly on board with this book. It focuses on three main things that parents can do to raise healthy, happy, and self-reliant children. But before he gets to those solutions, he spends two chapters talking about the importance of teaching your child self-control and conscientiousness (e.g. honesty, hard work, responsibility, etc) and also the common misconceptions that you can’t be both loving and strict as a parent. Sax refers to parents who are both loving and strict in their relationships with their children as “just right” parents (that is, not too lenient and not too harsh). (I’m sorry, but is this the longest blog post in the history of the universe? I hope you had nothing better to do than read this. You also probably could have read the entire book in less time). So! The three things he talks about for being a “just right” parent. First, teach your child humility. Which is basically a totally unAmerican virtue right now. We live in an era of self-esteem building and trophies for everyone. Sax defines humility as being as interested in other people as you are in yourself. In not feeling like you’re better than everyone else and your views, thoughts, and activities are more worthwhile, interesting, and better than anyone else’s. Sax’s number one suggestion for teaching humility is chores. He says that by letting your child off the hook for chores around the house, you’re telling them, “Your time is too valuable to be spent on menial tasks” which is easily interpreted over time as “YOU are too important to do menial tasks.” (And unless you have a housekeeper, it basically means that you as the parent are perfectly unimportant enough to do menial tasks. No surprise, then, when that child doesn’t respect their menial dishwashing parent and that parent’s time). He also suggests keeping social media to a minimum because social media tends to be so ME focused. Next, he talks about making sure you enjoy your time you spend with your child, which usually requires that you stop multi-tasking (studies show that dads enjoy their time with their children more than moms do, and part of that seems to be that dads are more likely to fully engage with their children rather than trying to also check their work email or do household tasks while they are with their children. Of course, if you’re a dad home with your child for only an hour or two day, it’s a lot easier to focus during that time than if you’re a stay-at-home mom trying to keep the household running, possibly running a side businesses or working part time AND being with your children). He’s an advocate for slowing down and not running your family ragged with events and activities, and, of course, putting down the devices. Sax is quick to point out that raising children is never a 1+1=2 activity. You can do everything “right” and have a child who flunks out of college or ends up in jail for drug dealing or hate you and never wants to speak to you again. But you can increase your child’s chances of success with focused parenting, and I felt like this book really inspired me to be a better, stricter AND more loving parent. And finally, teaching your children the meaning of life. That success isn’t the same as happiness, and that probably not everything in your life will work out how you hope, whether that’s not getting into your dream college, losing your job, the death of a spouse or child, health problems, and all the other numberless possibilities. The point of this life is not to be famous or rich, and to learn that it’s okay to fail and how to move past failures and disappointments. If your child feels like their whole identity rides on being accepted to Harvard, what happens when they get the rejection letter? What are you teaching your child by example about what really matters in life and how happiness is obtained no matter what your house and cars look like or how big your bank account is or how prestigious your job is? This book is really a pretty quick read (and the actual book is only 200 page), but I feel like it asks some really significant questions that I kept mulling over long after the book was done. I’ve been much faster to require my children to help around the house and expect them to quickly do as I ask. I feel like it’s helped me recognize more clearly that Bart and I are the authorities in this house and that just because some of our children are capable of throwing impressive tantrums when they don’t get what they want doesn’t mean they get to run the show. I know I say this every time I read a really great non-fiction book, but I’ll say it again. If I belonged to a book club where I was responsible for choosing a book, this would be the one I’d pick this year. Now I need to read his book focused on parents of daughters, Girls on the Edge. Obviously I haven't read the book, but I don't get the correlation between letting kids slide on chores and treating them like grown ups. If anything, that's treating them like kids, because adults don't really get to slide on chores. My personal experience has been the opposite, people treat their kids like kids far beyond when they need to. My kids have a lot more freedom than a lot of their friends. My son is 11 1/2 and my daughter is 9 1/2. They are allowed to play outside without me. My son is allowed to walk the half mile to his best friend's house alone and my daughter would be if she had friends close enough. At the grocery store, they each get a list and a cart and they help me. I'm hands off with homework. If it doesn't get done, that's on them. In contrast, my neighbor won't let his 12 year old out of his sight at the grocery store. Rhode Island tried to pass a law making it illegal–ILLEGAL–to leave a child alone up to age 12. At 12, I was babysitting infants. We have to sign reading logs, teaching our kids that we don't trust them and they can't be accountable without an adult hovering. When he refers to treating children like grown-ups, he means more that parents act as if children are their peers and their wishes hold as much sway as an adult (aka, "My child wants to play video games all night long, and I just want him/her to be happy, so I don't feel like I can unplug it and make them go to bed" or "my eleven-year-old doesn't want to go on our family vacation, so I shouldn't force them to come along"). And then he talks about how that early allowance of your child to run the show makes it difficult for them to grow up and become competent REAL adults because they've haven't learned to be self-disciplined and do the kinds of unpleasant things grown-ups have to do all the time (grocery shopping, cleaning the bathroom, getting up early for work every single day, making doctors appointments, etc). Thanks for this response as I was confused by the title of the book too. I actually agree with you, Kayris, as I think kids need to have responsibility and the rewards that go with being responsible, like being able to walk to your friends' houses without Mommy tagging along. Thanks so much for the complete review of the book! I love the third point "success isnt the same as happiness". I've said this over and over to my husband. I think it's important, for everyone, to know that being happy is a success in its on way. Your paycheck will buy temporary happiness but not real happiness. This sounds like a fantastic read! Janssen, Thank you for this! This book has been on my reading list for a few months. I definitely need to check it out. I started reading this the other day, and have been riveted since page one. It makes total sense, and I feel more empowered as a parent by applying it. My three year old isn't liking that mom is digging her heels in, but she is happier and so am I ? I feel like this is the kind of book hospitals should send parents home with when they have a baby. The principles apply from birth on. I would like to add that happiness is a feeling and it is transient as any other. If we plan for or expect happiness we are in trouble. Meaning will endure. This does sound good. Thanks for the recommendation! Thank you for taking the time to write such a thorough review. I saw the picture you posted a few days ago (was that on Instagram?) I thought I needed to find this book. Luckily they do have it at my library. I read "The gift of failure" when you suggested it several months ago, and found it pretty interesting. Now I really want to read this one. Great review. I happened to see it at the library yesterday and snatched it up. I flew through the first 5 chapters. This book, and your subsequent clarification from the first comment sounds great. I find myself way more authoritative in parenting style than many of my peers, but it sounds like that's the parenting model he's advocating. So often when I read a book like this I think the summary is "follow the prophet".